Like many of us, I have heard my share of political speeches. Some are yawners, some are the same old thing, after some - I have to admit that I wondered why did anyone bother making because they were just that bad. While watching the 2012 Republican National Convention, I listened to the many speeches and took note to the fact that the speeches weren't that bad at all. There were times when speeches stood out from the others, Republican Governor of New Mexico Sasana Martinez gave a wonderful speech. 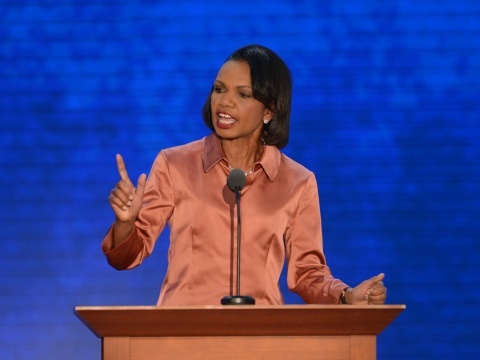 But for me, I sat with riveted attention as former Secretary of State Condoleezza Rice spoke. "Thank you so much. Good evening. fellow Republicans. Good evening, my fellow Americans. We gather here at a time of significance and challenge. brave souls who died so that others might live. desperately needed at home and abroad. response, and everyone asks, where does America stand? will defend and support them. We will sustain a balance of power that favors freedom. Now, to be sure, the burdens of leadership have been heavy. lines of freedom, and we owe them our eternal gratitude. rewarding to speak for those who otherwise do not have a voice. Venezuela, the political prisoner in Iran. our country. And I know too -- I know too there is a wariness. vacuum who does not share our values. reluctant to lead and you cannot lead from behind. know that we will be reliable and consistent and determined. peace really does come through strength. gas resources here in North America, and we must develop them. our environment, but we must develop them. loses control of its destiny. matter where you came from, it matters where you are going. we are a compassionate nation of immigrants. that one's status of birth is not a permanent condition. achievement, not from lax standards and false praise. rights issue of our day. and the scourge of segregation. wanted to be, and she becomes the secretary of state. the integrity and the experience and the vision to lead us. who we are in the world and what we offer. this exceptional country: The United States of America." Her speech was interrupted with applause after applause. Then at the end, there was a well deserved standing ovation for this most incredible woman. Condoleezza Rice is an inspirational American. She is an American political scientist and diplomat. She is a professor at Stanford University, and she is a Conservative and a Republican. She received her education from the University of Denver (1981), University of Notre Dame (1975), University of Denver (1974), and Miles College. She served as the National Security Advisor and then the 66th United States Secretary of State for President George W. Bush. She is age 57, born on November 14, 1954, in Birmingham, Alabama. She is the daughter of a high-school guidance counsellor and later a college administrator (Reverend John Wesley Rice) and music teacher (Angelena Rice), a family that was a fixture of the rigidly segregated city's black middle class. There can be no doubt that the mid-century Alabama of segregated water fountains, segregated restaurants and amusement parks, and of course segregated schools had an effect on the young black American girl surrounded by such injustice. At the age of 9, a bomb exploded at a Baptist church a few miles from Westminster Presbyterian Church where her father was a minister. Four black girls were killed, one of them a kindergarten classmate of Rice. Condoleezza Rice is an inspiration to all. She is proof, that against all odds, the American Dream is alive and well and obtainable. Voters To Uncle Sam: "Leave Me Alone!"